Oh hello there — are you looking for a friend? 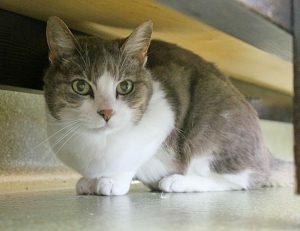 My name is Cousette and I am just the sweetest 12-year-old lady kitty you will ever meet! I lived a long and lovely life with my former owner before she passed away and her family was unable to keep me. I know I was really well-loved because I’m a huge fan of everyone I meet and I am in excellent health. Like many older kitties, I’m a little hyper-thyroid so I do take a very cheap medication daily to keep me feeling my best. I have lived around other cats, dogs, and children — in fact, I seem to really like children and will get up to greet them when they walk into the Pixie cattery! I’m very mellow but also extremely loving and will quickly crawl into your lap if you’ll take the time to sit down with me. I also am just cute as can be — have you seen my cute little pink button nose? I’m a relatively small and low-maintenance kitty and I think I’ll fit right into your life — won’t you come meet me? 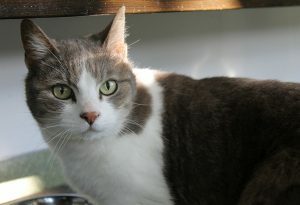 I come to you spayed, vaccinated, and micro-chipped for an adoption fee of $80.